Frugal & Fabulous: Review & Giveaway: Jackpot Candles! Review & Giveaway: Jackpot Candles! I am not the most creative gift giver so I love finding unique and interesting gifts. This one is a new favorite! Candles are an easy gift, but why not add a little surprise in there too? Jackpot Candles gives you the option to give two gifts in one- a delicious smelling candle and a beautiful piece of jewelry! How does it work? First you pick the candle scent (I picked Blueberry Muffin) and then you pick the type of jewelry (earrings, necklace or ring with your preferred size). Your candle comes directly to you (or your recipient) with the jewelry hidden inside. As a special bonus, the jewelry can be worth anywhere from $15- $5000! I burned my candle for maybe 10 hours before I could reach the ring inside. I just pulled it out with a pair of tweezers. It was wrapped in foil and the ring itself had a tag with a number on it. You then take the number from the tag and look up the value on the Jackpot Candle appraisal page. 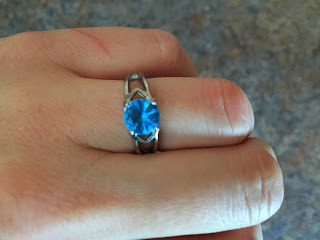 My ring was only worth about $35 but it was really pretty - and it fit me perfectly, which was great! These aren't your average candles- they are beautiful, clean burning, 100% soy candles. They are also 100% made in the USA! The candles come in a range of different scents including Banana Nut Bread, Birthday Cake, Caramel Coffee, Cinnamon Sensation, Hot Fudge Brownie and more! These candles are also infused with essential oils for ultimate relaxation and enjoyment! They burn anywhere from 80-100 hours which is a very long time! I've been enjoying my candle for over a month now and its barely made a dent -which is awesome! 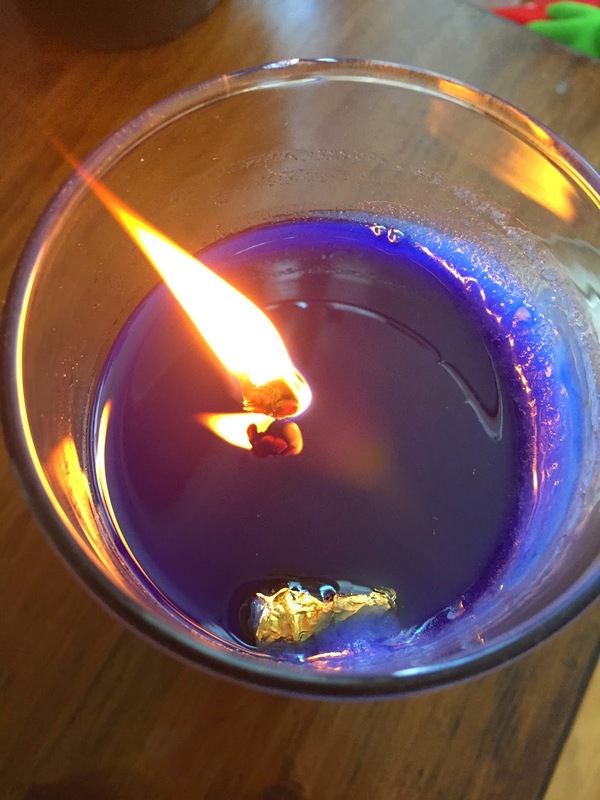 Blueberry is one of my favorite scents for candles- and this one is absolutely awesome - it smells like real blueberry muffins- there isn't anything artificial about it, it just smells sweet and pure. Did I mention my ring matches my candle? 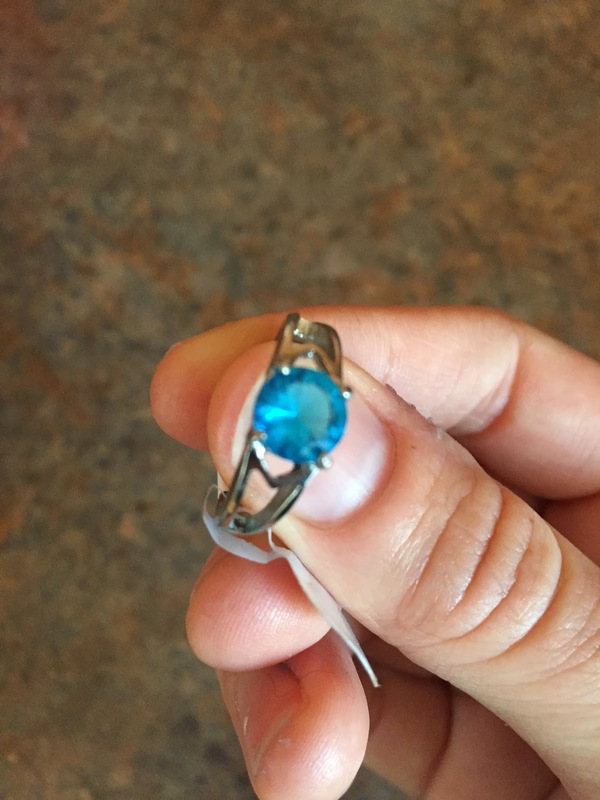 It might not be a real topaz but it certainly looks like one! Verdict: I love my Jackpot Candle and the ring that came inside! This is such a nice gift or treat for someone special in your life. Mother's day is coming up - pick up two and get free shipping! Gift shopping is officially done! Buy it: Jackpot Candles can be purchased from their website, and retail for $24.95. Submit your email address on their website for $5 off your purchase! Cinnamon sensation would be my choice. I visited the Facebook page, but I had to go through their website for the link. I love the pretty pink Sweet Pea candle. The Lilac Jewelry Candle is one I like. I would love cucumber melon - so spring-y! I am most interested in Ocean Breeze. My favorite candle is the Pina Colada Candle. I love anything that smells like the tropics!! I would pick the Birthday Cake Jewelry Candle. Ocean Breeze sounds mighty nice. I would love the Lilac Candle. I would like the Pina Colada Candle. I love that scent! I'd love the Caramel Coffee Latte candle! Hot fudge brownie sounds yummy! I would really like Caramel Coffee Latte, Pina Colada, Vanilla Cupcake or Ocean Breeze. They all sound wonderful! I'd like blueberry muffin too! Or vanilla cupcakes. Hot fudge brownie or watermelon both sound really good! I really love the Christmas Candle, but also the Lilac sound great also. I like the Vanilla Cupcake candle. I love clean and fresh scents. So I like the Ocean breeze. Cinnamon Sensation would be one of my choices. Sweet Pea Jewelry Candle,, i love the scent of sweet peas! Oh the Cherry Blast would be my first pick, although they all sound so good! I would love the Birthday Cake candle, I bet it smells amazing! I'd pick caramel coffee latte. The Birthday Cake and Blueberry Muffin candles sound great! I would love the Lilac. I would love the Lilac jewelry Candle please. kristiedonelson(at)gmail(dot)com Thank you. I would love ocean breeze! I'm most interested in the Birthday Cake candle. They all sound great! I think I'd choose Sweet Pea. I would Soooo choose the Sweet Pea!